Showing results for tags 'rivet'. 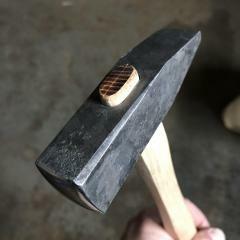 Just finishing up this bench hammer. It’s about three quarters of a pound. Good addition to the bench for layout and small rivets. I made this rivet heading/upsetting tool today based vaguely on pictures I saw online. I think it will work all right, I plan on using it to make some tong rivets soon. Stupidly, the center of mass makes the spring side dip down when trying to clamp it in the post vise... I might shorten it up someday so it doesn't take 3 hands to use this thing. I'll also take a die grinding bit to the countersinks and round them over some more tomorrow. I clamped a shim in the jaws when drilling the holes so they will grip the rod well. The holes are 1/4, 3/8, 5/16, and 1/2". 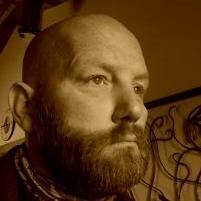 David Kailey posted a topic in What can I make? Got an order for 5 corbels......then another for 20. I always post what I am up to on IG and FB......I have had people say so of its not worth posting, its to easy to make,........ bla bla bla.......it dosen't show case my skills.... Well these are about as simple a corbel as a guy can make......customer ordered 5 of them....easy $250 job. I posted them today at 1pm and then I got a call from a guy 450 miles a way...... he saw them cause his buddy follows my IG account.....he loves them and is putting in a set of wall shelves..... he ordered 20 of them at $50 each....... easy 12-14 hours of work maybe $50 in materials...... nice little payday to keep the lights on and the doors open. I recently picked up an old rivet forge made by Canedy - Otto Mfg Co, usually known for their drill presses and larger blowers. I don't have a lot of info so I hope some of y'all might be able to help. Well I went to work restoring/refurbishing it as well as making upgrade like repairs in the prossess. Here are some pictures of the forge as I got it. The blower does turn but its not smooth and I worry that with every turn it could break a tooth. It's definitely not clean or lubed. Inside the forge is a brake rotor and tongs. The rotor will come into play later. As you can see, its been neglected for quite a while. We'll start with disassembly and wire brushing. It all started off easy, but then there was one stubborn bolt. I cleaned out and cut the slotted head, but it broke one of my flat head bits. So I cut into the back of the bolt, still to no avail. So finally I cut it off with the angle grinder. With a bit of gentle persuasion I got the extension off. As you can see its in pretty bad shape. I continue disassembly with the legs. The hardware was dirty and rusted. A little brush down with a wire brush and some WD-40 got the bolts out. The blower was attached with two bolts. Those came out without incident. Now I get to really clean it. I started brushing it down and found the gearbox had a separation where the lid goes on, so I opened or up. Here is a before and after showing how it is now compared to how gunked up it was. I cut a layer off the rotor so it'd sit more flush to the bottom if the pot. I also cut the pot to fit the rotor. It is so cracked and decayed that I don't feel bad about cutting it to make room. I prepared the metal for welding. As I welded in sections to stress the metal less I disassembled the legs further, wire brushed them, and painted them with rust converter. Put it all back together (plus some spacers under the pot and some new hardware where needed), grease the gears, and you're done! I'll make another post just for all the finished photos. Good morming all, I have just recently made a sushi knife for my friend for some practice. It was coal forged from 1084 H. Carbon steel and properly hardened/tempered. I put on a mirror finish but find that upon slicing hot foods, rust blooms instantly appear and give the blade a wacky "tie-dye" look. Is this something that can be avoided with treatment? Or will the blade need to be cleaned between cuts? Im still an apprentice so thanks for any advice. Helpful tips for fixing rivet forge? I've been wanting to get into smithing for some time now. I've been collecting all the things I need; anvil, tools, even building a shed. I was planning to build a brake drum forge, until my Grandmaw bought me a rivet forge from a sale. So now im going to use it. First though, it will need some work. I'm going go take it all apart and clean it. But my main problem it the hand pump mechanism. Not quite sure what the correct term is. I was planning on winging it together, using the guess and see if it works technique, but figured I'd ask if anyone knows what I need. Hopefully save some time and aggravation and doing the same thing over and over until its good enough to make me happy. Any suggestions for: - Lenght of handle - Distance on handle for connection to forge, and also the thing that turns the wheel. - Distance offset from rim of forge - Should I clay this forge? - Anything else I need to know Also, anyone know the maker, or date period for this forge? I tend to too closely match my rivet holes to my rivet size. Or, due to heat expansion when punching, I overestimate the hole size while hot. End result is I often have difficulty getting a hot rivet ro fit easily but not too easily into the cold, possibly shrunken hole. How do you personally fit your rivets to your hole so that it can readily be inserted hot and then properly headed without being too sloppy. Or perhaps I am trying too hard since a hot hammered rivet should probably fill an oversized hole within reason. Looking for guidance or a rule of thumb on this? It's very annoying to have to go through getting a rivet installed with several heats, rivets getting stuck, bent, needing be ground to fit or otherwise causing various bits of Re-work. I have done several of these and I just keep tripping myself up.